I have been reading as much as I can about China lately! (Obviously!) I decided I also wanted to read about missionaries to China. Who better to start with then Hudson Taylor? I already owned the book “Hudson Taylor’s Spiritual Secret,” and even though I’ve read it before, I decided to read it again. I discovered some very exciting truths about God and abiding while reading through his life. I HIGHLY recommend this book! You can find it on Amazon for about $5 for the Kindle, or about $4 (used) on paperback. Hudson Taylor's early life was characterized by striving. He was determined to go to China from an early age. His whole aim while in school, and then his apprenticeship with a doctor, was to train to go to China. He worked his entire young adult life working hard in furthering the gospel, first in Scotland and then finally in China. He founded "China Inland Missions" in 1865 and through his leadership it grew to be a major mission board, now known as OMF International. We strive so much as Christians. Hudson Taylor's "secret" - Andrew Murray’s "secret" - is not a secret. It is the truth found in John 15. Abiding in Christ is the key to resting and working. That is where the name of my blog came from. It is this balance that I try to have in my life: resting and working. Resting in God and His continual power. Working for God and bringing Him glory. We rest in God and His power. Our salvation and sanctification is dependent on God. God is the author of salvation and He is the power behind our sanctification. We cannot just “Let Go and Let God…” Although God supplies the power, we must still do our part. Most of our part is the day-to-day, living and looking to Christ. Hudson Taylor learned later in his life this “spiritual secret” - He wrote to his children often, trying to explain to them the balance between resting and working. He wanted them to learn it early. Although Taylor suffered many things for the gospel, he did not waiver in his devotion or ambition. Early in his life, it was his own ambition and determination that kept him going through various trials such as lack of funds, riots, and persecution. Towards the end of his life, he wrote about how resting in God was the real key to his devotion. He writes that God showed him in His word how a sense of settled calm and joy can remain in one’s heart, even in the midst of hardships. He experienced many hardships later in life as well – with the loss of a daughter, son, and his wife. Yet, others marveled that he continued to minister to those in China through it all. He says that it wasn’t his ambition anymore than spurred him forward – but the calm assurance that the Almighty God would supply all his needs, including his spiritual needs. His testimony can be our testimony as well. It is no “secrect." Hudson Taylor’s God is our God. Andrew Murray’s God is our God. We need only to obey and surrender. God will use our willing heart and give us the power to work. To serve in Sunday School? To sing in the choir? Through it all…..you are loved. 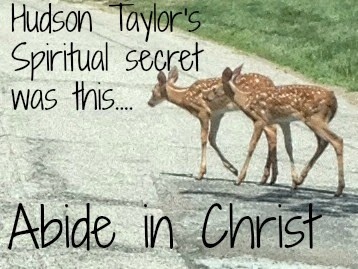 I would like Hudson Taylor’s “Spiritual Secret” to be my spiritual secret – only let it be a secret that nobody keeps! 'On the contrary,' was the earnest reply, 'I often think that God has have been looking for someone small enough and weak enough for Him to use, and that He found me.'"